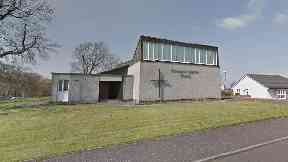 The body of the 61-year-old was discovered next to Westwood Baptist Church in East Kilbride. A major police investigation has been launched after a man was found dead outside a church in South Lanarkshire. The body of the 61-year-old was discovered on a path next to Westwood Baptist Church in East Kilbride at around 8.40pm on Saturday. Police are currently treating the death as unexplained. A Police Scotland spokesperson said: "The body of a 61-year-old man was discovered at about 8.40pm on Saturday, January 19 on a footpath near to Riverton Drive. "A post-mortem examination will take place in due course. The death is currently being treated as unexplained. On Sunday morning, Westwood Baptist Church announced on Facebook that it would be closed for the day. The statement read: "Due to an ongoing police incident, the grounds of both the church and the community centre are cordoned off and no access is permitted today.